One of my favorite things to do when visiting a new city is to check out the local shops. And when I find a great gourmet food store, I have a hard time restraining myself. On a recent visit to Cologne I found two new favorites; one a gourmet shop and deli inside a high-end department store, the other a world-class bakery that has been in business since 1893. Manufactum is a department store with ten branches across Germany, similar in style and product range to the Spanish Corte Ingles. 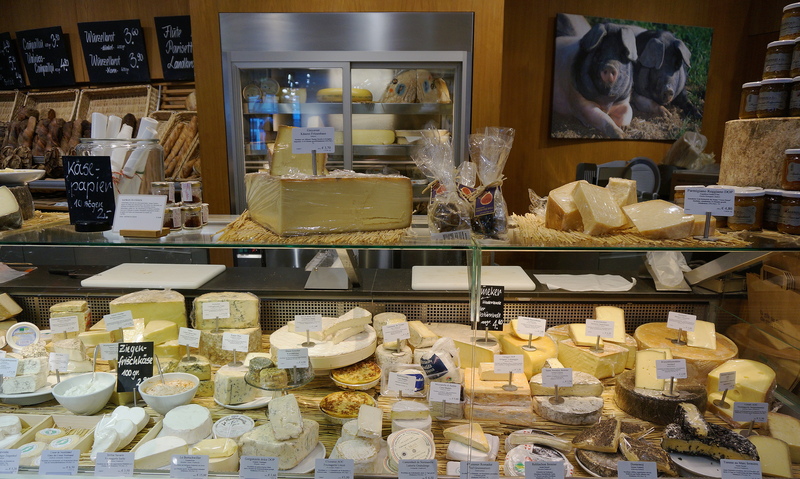 As you enter from the street, the first thing you’ll see is their fabulous deli “Brot und Butter“, where you can choose from a wide selection of regional and imported cheese, charcuterie, and delicious fresh-baked bread. The aisles are filled with an assortment of beautiful, decorative tins of French caramels, Italian cookies, and jars of artisan preserves and honey. There’s also café seating nearby where you can give your feet a rest and enjoy a coffee or a small meal. Walk further into the shop and you’ll find plenty of unique, well-made home goods, clothing and more to tempt you. Manufactum is a fun place to visit, even if you’re just window shopping. There are great bakeries around every corner in Cologne, and in the afternoon they fill up with people taking a relaxing coffee and pastry break – a custom I am happy to adopt! If you’ve got a sweet tooth, you will be spoiled for choice at Fromme konditorei – a bakery founded in 1893 that specializes in traditional German and Austrian-style patisserie. Everything I ate here was very high-quality, well-prepared and delicious. Fromme is also open for breakfast, and I had the best eggs ever here, so good that I went back for more the next day! Germany has a rich culinary heritage, making it a favorite destination for food lovers. And for visitors to Cologne there’s no shortage of great shops where you can indulge in delicious pastries, chocolate, cheeses and other treats. Put these two new favorites on your list and be ready for lots of walking to burn off those extra calories – they are so worth it! Breakfast at Fromme – great way to start the day!